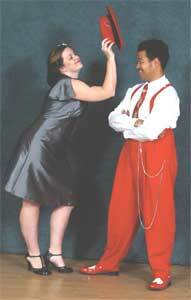 Yes, "The thing about swing dancing..." is so many things! It's fun. It's challenging. It's good exercise. It's a great way to meet a bunch of nice people. And, it's contagious! Each on of has that moment of epiphany, when we saw something that made us all just HAVE to do it! What was the moment that made you just "have to do it"? Where were you? What did you see? My experience with this thing we call SWING started back in early 2002. I had never danced before in my life (aside from the ChaCha or Electric Slide) nor had I really had any contact with swing. However, my family was planning a party for my grandparent's 50th wedding anniversary and I thought it would be a great surprise for us to be able to dance to some of "their" music (little did I know that it would soon become MY music as well). I started a friend of mine on the search to find us some teachers. She stumbled upon a couple that taught East Coast Swing in Manhattan Beach (unfortunately you don't come into the picture just yet). We signed up for privates with them and I was hooked from the first lesson. I watched them dance together and knew I wanted to do that. The thing that amazed me right off the bat was that there was no verbal communication between the two of them. It wasn't choreographed at all! The fact that I could dance with someone like that and get them to do all these great and fantastic things without even speaking to them was just amazing to me. I remember when they were showing us all of their Jack & Jill trophies. I remember thinking how impossible it must be to be paired up with someone you don't know and to have to be judged on your dancing. I know I keep using the word "amazing" but really...that's the word that kept coming to mind. I thought I could NEVER do that. Well, the anniversary party came and it was a blast. My brothers and I even rented Zoot Suits! My grandparents loved it. Afterward, though, we all dropped swing for awhile. After several months of trying to talk ANYONE into taking lessons with me, my sister finally agreed and we decided to contact our old instructors. Much to our dismay, we found out they closed up shop and moved out of state. That was very sad for us but it resulted in me searching the yellow pages for a new school. I don't really know why I called you. Your ad said "Lindy Hop" and I had no idea what that was. I wanted to continue my East Coast. But I'm very glad nonetheless. I remember your cheery voice over the phone when you returned my call. When my sister Dana, our friend Bernie, and I attended our first class with you it was over at the place next to the Elks Lodge. It was so funny to us to see you dressed all vintage in class. It was adorable and we'd never seen that before. Well, you were so fun and welcoming that we immediately decided we would stay. We were informed that there was a swing "community" in the South Bay that we never knew about. It was exciting. A few months after that, you saw something in me you really liked (couldn't have been my dancing) and I received my invitation to join The Swing Shift Fliers and never looked back. Maybe it had something to do with the constant smile I had on my face regardless of what my feet were doing. =-) I still have that by the way. The bigger the smile, the least control I have of my feet. I have come to love many things about swing. I LOVE the music. It so fun and happy. When I hear it playing, I can't help but smile and tap my feet. I don't care if I'm in the Pottery Barn in The Manhattan Village...I wanna DANCE. I LOVE the clothes. When I put on one of my zoot suits and walk out my front door, I feel like a million bucks. I especially LOVE that we are keeping something going that is part of my heritage. My grandparents were jitterbuggers and if it wasn't for arthritis creeping in, my grandma would show you a thing or two or three. The look on their faces when they watch me dance is priceless. I can almost see in their eyes the memories of good times on the dance floor. I LOVE the wholesomeness (is that a word?) of it all. I LOVE the great people I've met. I also LOVE the places that swing has taken me. I've performed at some really great places including The Queen Mary, The Reagan Library, Maxwell's at the Argyle, The Rhythm Club (of course), and The Ritz-Cartlon. Not to mention the various street and county fairs. I've met some truly wonderful people and been in the presence of some phenomenal talent all thanks to swing (and you). Thank you Rusty. Do you remember when I told you one day I would be teaching with you? I've even had the privilege of doing that several times. I know I've rambled on and on but that's the majority of my story. I'm still dancing and hope to continue for many years. I hope you can cut and paste this into something useful to you. Thank you again Rusty. This thing called swing that you've helped me learn has brought much joy to my life.